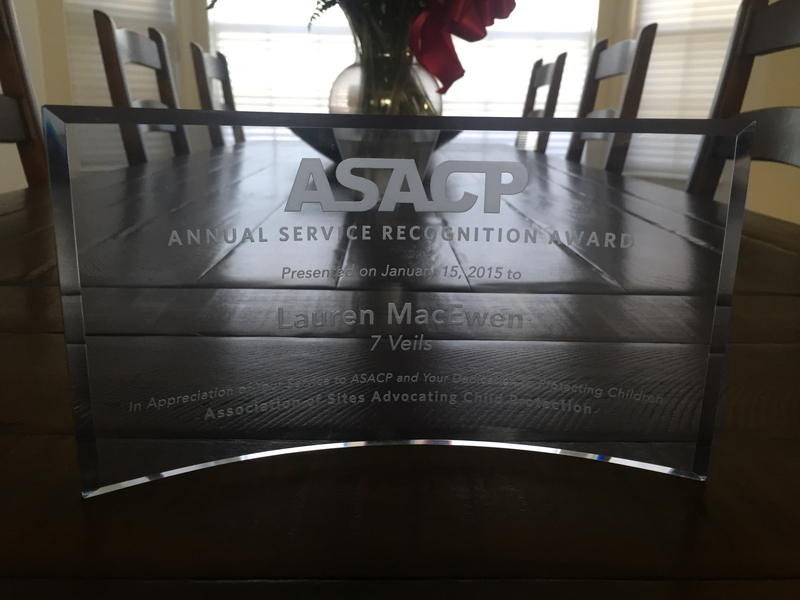 We were honored to have our CEO and primary strategist, Lauren MacEwen, receive the ASACP Service Recognition Award. The ASACP Service Recognition Award was established to honor the dedicated volunteers who have helped the association to carry out its mission of protecting children and at-risk youth by providing vital assistance and services. An engraved crystal trophy representing the honor was presented to MacEwen by ASACP’s Executive Director, Tim Henning, at the recent 2015 XBIZ Awards show in Hollywood. Previous ASACP Service Recognition Award winners include attorneys Lawrence Walters, Marc Randazza and Greg Piccionelli, plus Cyber Stampede’s Rodney Thompson and Scott Rabinowitz, Epoch’s Joel Hall, Cydata Services’ Brandon Shalton, adult film performers Stormy Daniels, Tera Patrick and Evan Seinfeld, as well as Fiona Patten and Robbie Swan of The Eros Association, and ASACP’s own Tim Henning and Vince Charlton.